Fourteen people have been killed after a roadside bomb targeted a minivan in Pakistan's north-western tribal region. Local government officials said the blast ripped through the van as it travelled through a minority Shia region of the Kurram tribal area, which borders Afghanistan. The area has a long history of sectarian violence. Five women and four children were among the 14 killed, while 10 people were wounded in the explosion. With few adequate medical facilities in the area, a Pakistani army helicopter evacuated the wounded to a nearby military hospital. 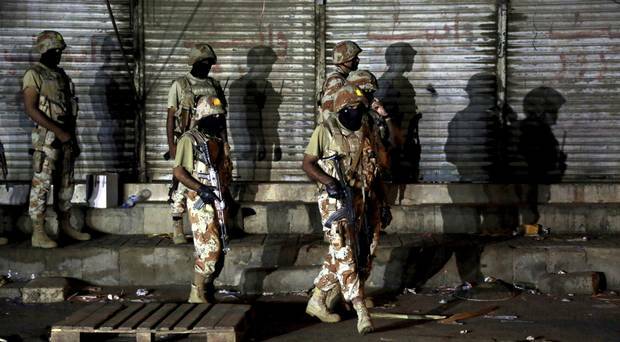 Jamat-ul-Ahrar, a breakaway Taliban faction, said it was behind the attack on the Shias. Pakistani Taliban and other Sunni militant groups often target minority Shias whom they consider to be heretics. The Islamic State group has also claimed several recent attacks in the country. For more than a decade, Pakistan has been fighting Islamic militants who have killed tens of thousands of people. Islamabad has also undertaken several large-scale offensives in the tribal regions in an effort to rout militants from the area. Four convicted members of the Pakistani Taliban were executed in a prison, the army said. In the southern port city of Karachi, paramilitary forces raided an apartment following a tip that militants were hiding there, police officer Aurangzeb Khattak said. After a seven-hour siege, three militants, including a woman, blew themselves up inside the apartment. The explosion also killed a five-year-old, while a fourth militant was killed trying to flee the scene.